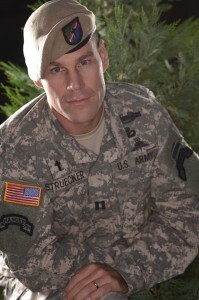 Jeff Struecker was a decorated soldier. At age 18, he enlisted in the United States Army as Infantryman and retired as a Chaplain with over 22 years of active federal service. in 2017, he was inducted into the US Army Ranger Hall of Fame. He served for ten years in the 75th Ranger Regiment in positions from Private to Platoon Sergeant. While serving in this unit Jeff competed in and won the David L. Grange Best Ranger Competition in 1996. He taught ROTC at the University of Louisville and was recognized in 1998 as the US Army ROTC, Noncommissioned Officer of the year. Jeff spent his final ten years in the US Army serving as a chaplain in Airborne and Ranger units. Throughout his career Jeff has attended numerous professional military schools and has received many awards and commendations. Some of his awards include the Ranger Tab, Combat Infantryman’s Badge, Pathfinder Badge, Master Parachutists Wings, Military Freefall Master Parachutist Wings, several foreign jump wings and the Combat Action Badge. He has been awarded other commendations and decorations throughout his military career. His combat experience includes participation in the invasion of Panama, Operation Desert Storm, Black Hawk Down in Somalia, and more than a dozen combat tours in Afghanistan and Iraq. Jeff has been awarded medals for valor in combat and has received many medals as recognition for his service in the US Army. Jeff holds a Ph.D. from Southeastern Baptist Theological Seminary in Wake Forest, NC. He also has several other earned and honorary degrees. Jeff is currently serving as Lead Pastor at Calvary Baptist Church in Columbus, Georgia. Jeff in an award-winning author with five books in print. He and his wife, Dawn, have five children and two grandchildren.